The Average temperature of the town is between 24/30 in Summer with nice Sea Breeze and mild 10/19 in Winter mostly with sunny days. You can enjoy lots of sport and nature activities during the day and have your good fun part at nights with lots of very lively restaurants, bars and discos! Our hostel offers mostly dorm accommodation with all en-suite dorms with max. 6 people per room. 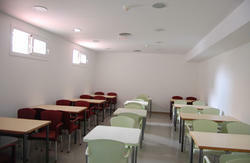 Facilities include:Air Con/Heating,Bed Linen,Key-Card Access.. The best ways to arrive are either by train, bus or with your own car or shuttle. *Once you have arrived at Calella,the Hostel is located on the Hotels Area.Our street is parallel to the Sea Shore and only 3 streets away from it,in front of the Kaktus Hotel.